In order to protect your infrastructure investment, damaged drain inlets need to be repaired as soon as a problem is detected. Inlets get damaged due to extreme flooding or poor construction. This presents risk of water seeping into the cracks and getting into the drain walls, causing even more disrepair. Inlets are the entryways of robust stormwater drainage systems, making inlet repair a priority if needed. Damaged drain inlets can also lead to street ponds, which in turn, result in road deterioration and erosion. Uncontrolled water flow due to storms or heavy rain need to be efficiently taken off the streets with properly installed drain inlets. 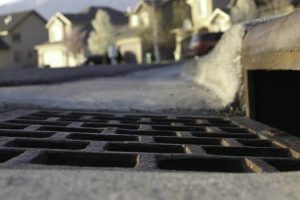 Most inlets have grids or grates that keep pedestrians, vehicles, and debris from slipping into the drain, while providing a nice view of the pathway. Inlets are a real basic necessity to keep flooding waters from wreaking havoc on your property. Asphalt Pavement Solutions can help with your inlet repair needs and also fix the surrounding damaged asphalt in the Philadelphia / Camden areas. We also proudly serve the entire states of Pennsylvania, New Jersey, and Delaware. Contact us today for your inlets repair consultation.